Amazing Grass Organic Wheat Grass Powder contains 100% organic, whole leaf wheat grass, one of the most potent leafy greens available. 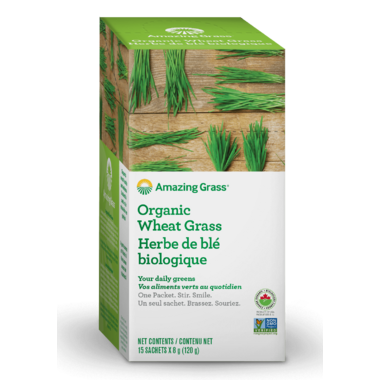 Amazing Grass Wheat Grass packets contain 100% organic, whole leaf wheat grass, one of the most potent leafy greens available. 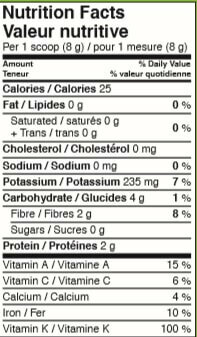 Our Wheat Grass gives you an antioxidant packed boost that alkalizes and energizes with every serving. One box of single serving packets, 15 individual packets per box. Serving size: one packet, 8 grams. Mix a packet with 8 to 16 oz of your favorite juice or water. We like orange, apple, or grape juice, or try it in a smoothie. Take it first thing in the morning to jump-start your day! We recommend 1-3 servings daily. The individual packets are very convenient. This product is great for providing energy in my diet shake.